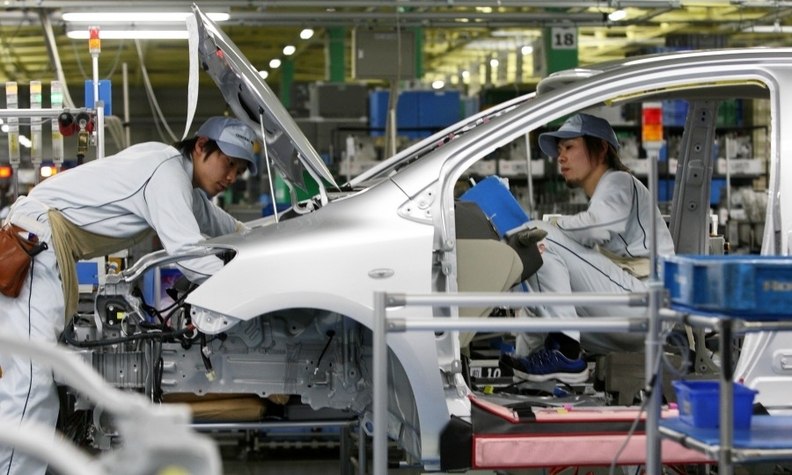 Workers assemble a Toyota vehicle on the production line of the automaker's Miyagi plant in Japan. Toyota resumed operations on today at all four domestic plants affected by the weather. TOKYO (Reuters) -- Most Japanese carmakers including Toyota Motor Corp. have resumed operations at their plants that were suspended after heavy snow disrupted parts deliveries, companies said today, limiting impact on their domestic production volume. But Mazda Motor Corp. said it suspended operations at its plant in Hiroshima as parts deliveries were delayed and Nissan Motor Corp. said operations at one of its plants were still stalled. Heavy snow around Japan has closed many roads, disrupting the delivery of goods and suspending car production for one or more days at Toyota, Nissan, Honda Motor Co., Suzuki Motor Corp., Mazda and Subaru maker Fuji Heavy Industries Ltd. as they rush to meet strong demand for cars ahead of a sales tax hike in April. "It may be difficult to fully catch up on the lost production volume, though that is up to how much the companies can operate their plants on the weekends," said Satomi Hamada, a senior analyst at IHS Automotive. There will be little impact on domestic sales, she added, because carmakers are likely to focus on making vehicles for the domestic market to meet strong demand rather than for exports. Toyota resumed operations today at all four plants affected by the weather, including the Tsutsumi plant where it makes the popular Prius hybrid, spokeswoman Kayo Doi said. Honda, Suzuki and Fuji Heavy also resumed operations at their suspended plants, the companies said. Fuji Heavy said it is still undecided on plans for Wednesday.